Why is deficit-challenged CPS proposing to spend over $1 million a year to “turn around” each of six schools, using a program that’s produced mediocre results — especially when teachers at four of the schools have voted to support a far cheaper and more effective turnaround proposal? Could the political connections of the Academy for Urban School Leadership — whose big-dollar donors include major contributors to Mayor Emanuel, like David Vitale, Penny Pritzker and Bruce Rauner — have something to do with it? Of twelve turnaround schools listed on AUSL’s website which the group took over between 2006 and 2010, ten of them are on academic probation today. Only one of them is rated as Level 1 — “high performing” — by CPS. Of those twelve schools, eleven were below the CPS district-wide average for ISAT composite scores. AUSL’s top-scoring school had a composite score that was equal to the CPS average, which is lower than half its schools. Three AUSL turnarounds at CPS high schools are abject failures, with scores far below district averages and negligible growth. UPDATED – While Cabrini Row House residents prepare to challenge CHA plans for mixed-income development, CHA resident leaders and housing advocates are questioning Mayor Emanuel’s update to the agency’s Plan For Transformation. The Cabrini-Green Local Advisory and supporters will hold a press conference Thursday morning (May 16 at 9:30 a.m., 530 W. Locust) to announce “a new initiative to protect the Carini Row Houses,” according to a release from the Legal Assistance Foundation. Row House residents have called on CHA to fulfill the promise in the original PFT to rehabilitate the development as 100 percent public housing; that plan was put on hold in 2011. Meanwhile, resident leaders and community organizations called on the CHA board to reject the mayor’s plan and return to the drawing board — and to heed input from the public, including an emphasis on preservation and rehab of existing units rather than subsidizing private development as the most cost-effective way to meet CHA’s obligations. Apr 9, 2013 Comments Off on Will Emanuel back privatization transparency measure? Will Emanuel back privatization transparency measure? Community and public interest groups are calling on Mayor Emanuel to support a privatization transparency ordinance that is expected to be considered by the City Council Rules Committee on Wednesday. The Privatization Transparency and Accountability Ordinance, submitted last November by Alderman Roderick Sawyer (7th) and sponsored by 32 aldermen, would require a cost-effectiveness study and public hearings when the city seeks to contract out services and operations. Along with a cost-effectiveness study prior to the award of any contract, Sawyer’s ordinance would require a study of possible alternatives in collaboration with unions representing city workers whose jobs could be threatened. City workers would also be qualified to bid on contracts through their unions. Noting concerns over unemployment, wage levels and workforce diversity, the ordinance would require that at least half of contract work be performed by city residents, and that contractors pay wages and benefits comparable to what city workers get for the same work. It would mandate City Council hearings and approval of contracts over $250,000. “I have a concern about touting a monetary savings if we haven’t thought about the people that will lose a job, the families that could lose a home and the local businesses that could lose a loyal customer,” Sawyer said when he introduced the ordinance. West Side parents and educators have called for a boycott of CPS’s school closing hearing Saturday morning and will hold an alternative community meeting instead (April 6, May Community Academy, 512 S. Lavergne, starting with a press conference at 10 a.m.) where they’ll present a community school plan. Perhaps Mayor Emanuel ought to go. In fact several communities have developed their own plans, including strategic visions developed by six Community Actions Councils sponsored by CPS to improve communications with its stakeholders. CPS has proposed closing four schools in Austin, impacting 2,000 students, according to Austin Talks. Saturday’s official hearing is for Louis Armstrong Elementary. SONS will present an alternative plan that will minimize school closings and save CPS money, Truss said. The plan is based on the strategic educational plan developed by the Austin CAC, which Truss co-chaired with Ald. Deborah Graham (29th). The council included 25 elected officials, LSC members, religious and community leaders, and city agencies. That plan focused on solutions to problems like high truancy rates and a lack of all-day early education programs, and proposed developing a range of curricular choices for Austin students, including an IB network running from elementary through high school. The tenth anniversary of the beginning of the Iraq War fell about ten days before CPS was set to announce what could be the largest single school closing operation ever. The parallels are striking: ambitious programs dictated top-down by politicians over widespread public disapproval, administered willy-nilly by overburdened bureacracies — both driven by ideology that wilfully disregards the perspectives of people on the ground. In Iraq — a war which Mayor Emanuel enthusiastically supported, and which has cost at least 200,000 lives and over $2 trillion to the U.S. treasury — there was a political and media consensus on the threat of weapons of mass destruction that depended on ignoring the facts being reported by international monitors at the time. There was a political, ideological hubris that ignored warnings of chaos likely to ensue. And there was a huge push to sell off publicly-owned enterprises, resulting in massive corruption. At CPS there’s a $1 billion “budget deficit” and a claim of 100,000 “empty seats,” and an elite consensus that this situation requires closing schools. The consensus depends on ignoring CPS’s record of wildly inflating projected deficits, as well as many unanswered questions about the costs and savings of closing schools — including the cost to struggling communities. It requires ignoring the fact that CPS doesn’t have an accurate measure of its utilization. Raise Your Hand and the Chicago Tribune have documented how the district inflates underutilization rates by using inflated class sizes in its building capacity measurement. And in community hearings, school after school, principals, teachers and parents, one after another, have argued that CPS’s building capacity measure fails to account for program capacity, the standard that is used by cities across the country — and a standard that would result in higher utilization rates. So CPS can’t really say what its budget deficit will be, and can’t really say how well its schools are being used. But these are details. The central contradiction in the establishment consensus over school closings is Emanuel’s plan to spend millions of dollars to open a new wave of charter schools. This puts the lie to every claim about budget constraints and empty seats. The consensus depends on ignoring the district’s stated goal of opening 60 new charter schools. It requires ignoring the expedited application process promised to charter operators — and the promise to identify underserved areas available for new charter operations — in the Gates Compact signed last year. It requires ignoring Emanuel’s statement that he hopes charter operators view the compact as “an opportunity to set up shop” in Chicago. It requires overlooking the strategy document for closing neighborhood schools and opening charters, revealed by the Tribune in December, that notes the “perceived inconsistency” and suggests staging the closings and openings in two phases. Throw in charter expansion, and budget and capacity issues go out the window. It becomes clear that the agenda is purely about privatization. It’s a textbook case of what Naomi Klein calls “disaster capitalism” — a theory first inspired by the “reconstruction” of Iraq — using (or creating) a crisis as cover for turning over public services to private interests. Barbara Byrd-Bennett talks about reestablishing trust between CPS and parents and communities – then she turns around and says that closing neighborhood schools has nothing to do with expanding charters. Since nobody believes that, continuing to repeat it doesn’t seem like a very good way for the new CPS chief to build trust. 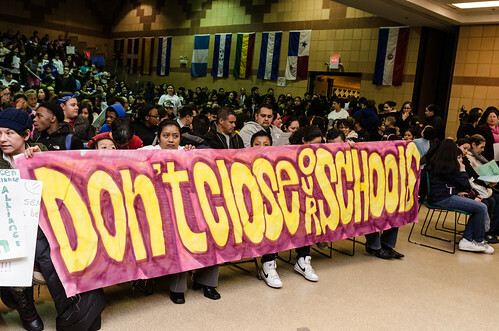 Recent revelations by the Chicago Tribune show that the rhetorical disconnect between school closings and charter openings is part of a conscious political strategy. A CPS document — which “lays out multiple scenarios for closing neighborhood schools and opening privately-run charters,” according to the Tribune — notes the main contradiction in the administration’s claim that closings are necessary due to underutilization and budget constraints: big plans to open scores of new charter schools. This “core prong of CPS’s academic improvement strategy” – charter expansion – creates a “perceived inconsistency,” according to the document. Therefore large-scale charter expansion must be held off until after large-scale neighborhood school closings are accomplished. Indeed, the problem is that charter expansion reveals that closing schools isn’t at all about “right-sizing” or saving money – it’s all about privatization. Byrd-Bennett has emphasized that the September 10 document – and specifically its “pre-decisional discussion” of closing 95 schools, mainly on the South and West Sides – predates her administration. Byrd-Bennett was chief education officer at the time; she was named CEO a month later. But Byrd-Bennett’s first proposal, a five-year moratorium on school closings, comes straight out of the September 10 document, according to the Tribune. Besides helping to sell the legislature on an extension of the deadline for announcing school closings, the document shows, the moratorium has the political utility of creating a sense of separation between school closings and charter openings. The document reveals a highly politicized approach to implementing school policy – a hallmark of the Emanuel administration, which has seen paid protestors and huge media campaigns attacking teachers. The document proposes establishing a ‘war room” to monitor community opposition to closings, and outlines possible steps to push back against that opposition.